Chlorophylls and Carotenoids are very important light receptors. Both classes of molecules have a large \(\pi \)-electron system which is delocalized over many conjugated bonds and is responsible for strong absorption bands in the visible region. 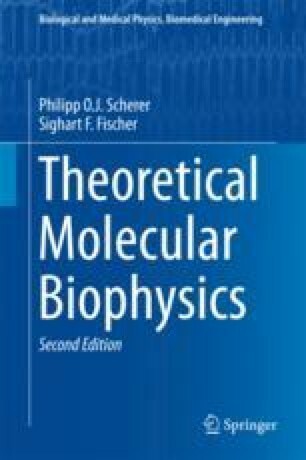 In this chapter, we introduce the molecular orbital method for the electronic wavefunction. We apply the free electron model and the Höckel MO method to linear and cyclic polyenes s as model systems and discuss Gouterman’s four orbital model for Porphyrins and Kohler’s simplified CI model for polyenes. Finally, we comment on energy transfer processes involving Chlorophylls and Carotenoids in photosynthesis. Consider a cyclic polyene with 2 N carbon atoms with alternating bond lengths. Determine the phase angle \(\chi \) and the eigenvalues for \(\beta \ne \beta '\). with the phase angle as in (b). (d) Find a similar treatment for a linear polyene with odd number of C-atoms.